She was the charm of the Malayalam movie's in mid 80's and 90's. On January 2006, Indian Government awarded her Padmashri for her contribution in Cinema and Classical dance. She won the Best Actress award for the film "Manichitrathazhu" in 1994. 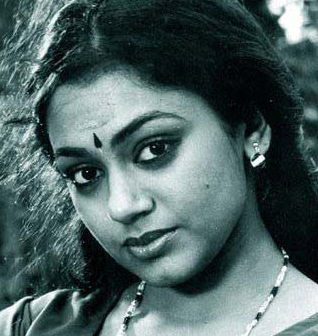 Yes, you got that she is non other than Malayalam actress Shobana, born on 1966 in Trivandrum. Her father Chandrakumar and mother is Anandam, while when she debuted in Malayalam cinema, she stole the hearts of millions of Malayalees. Shobhana made her debut in 1984 with the movie "April 18" directed by actor Balachandra Menon and her next movie was "Kanamarayathu" with Mammootty in 1984. "Pavithram", "Minnaram", "Maampazhakalam" and recently in "Sagar Alias Jacky". Shobhana came from the family of Lalitha, Padmini, Ragini, who were known for their Classical dance and acting in South film industry. She is the niece of Lalitha, Padmini, Ragini and she learned her Bharathnatyam basics from Chitra Vishweswaran (Her Guru) and in Chidambaram Academy at Chennai. She founded a dance academy for Classical dance in 1994 named "Kalarpana", which is organizing many shows in India and abroad, which helps handicapped children. She recently was in the news for marriage and for adopting a baby girl Anantha Narayani. Shobhana has acted in about 100 or more movies include Malayalam, Tamil, Hindi, Kannada and Telugu languages. She won National Best Actress award twice for "Manichitrathazu" in 1994 and "Mitr- My Friend" in 2001. Shobana still resides in the heart of true Malayalam movie lovers. mollywoodframes.com salutes her passion for classical dance and wish her prosperous life for long.